What a beautiful October week we have in store! Nearly 4 inches of much needed rain has soaked the ground and it’s time to GET SERIOUS about planting and rearranging your gardens at last. The cool nights create misty mornings and the dew on the ground helps newly sown grass seed to germinate. We have a super selection of fall blooming perennials awaiting you at Natureworks. Lots and LOTS of them in fact! This is the garden next to my deck. My Helianthus ‘First Light’ is in full bloom this week. I sit and listen to the buzzing of the bees as I relax. It is interplanted with Molina ‘Skyracer’ and evening scented Nicotianas. That’s a moonflower vine growing up the post. Heaven. This Saturday morning is our last Early Bird Sale of the year. Shop between 7 and 9 am and you will get a $5 gift card good for any purchase of $20 or more. Plus, we will have hot, organic coffee waiting for you. At 9:30, the theme of our Fall Gardening School workshop is Garden Renovation. The instant the rain stopped on Sunday morning, I was outside for the entire day dividing and rearranging my perennials (“plants on wheels” is what we call it…. ) 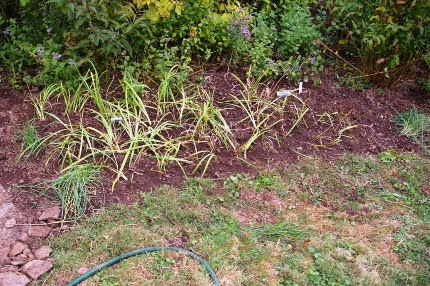 I attacked four massive clumps of Japanese irises, my Phlox paniculata ‘Tracy’s Treasure’, and more. I have been working on an action plan since the summer, correcting all sorts of design problems such as crowding, gaps in color, and funky combinations that just don’t work. Join me to gain an in-depth understanding of how you too can improve yourgarden this month. Don’t wait until spring, by then all of your problems will have disappeared…temporarily. Correct them now! One of four large patches of Japanese irises that I divided on Sunday. I edged the walkway with some clumps of self-sown culinary chives and added a self-sown pink New England aster to the background. This Sunday is our second Halloween-themedFairy Festival. Check out the happy faces of the children in this picture from last year. Activities include Fairy (or goblin) house building in the Natureworks gardens. 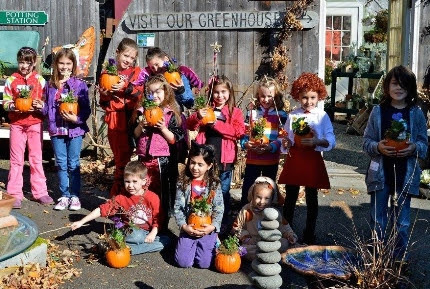 Participants will make and take home a Pumpkin Paradise mini-garden made out of a hollowed-out sugar pumpkin and seasonal annuals. This year we are encouraging the kids to come in costume. Registration information is below. This is our last fairy festival of 2015. Don’t miss out! 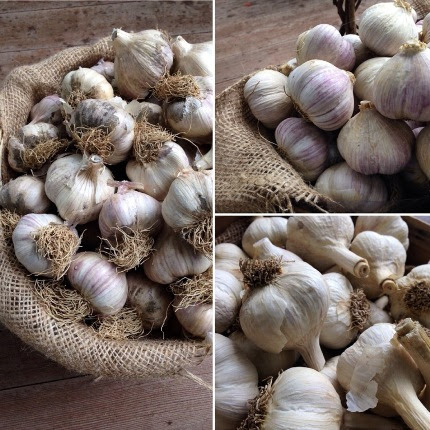 Our organic seed garlic is here and it is amazing this year! All weekend long, garlic was flying out the door. Last year we sold out fast, be sure to stop by this week and get yours. 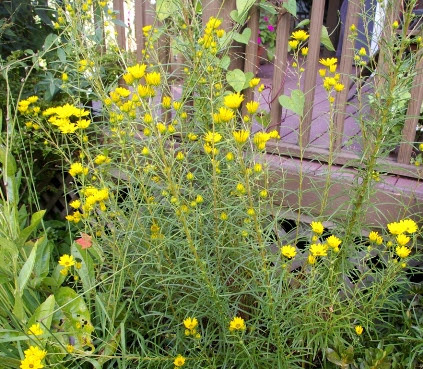 11 monarch butterflies on Sunday and they headed straight for our asters. It is REALLY important to provide lots of nectar for our late pollinators in October. What’s blooming in YOUR garden this week? 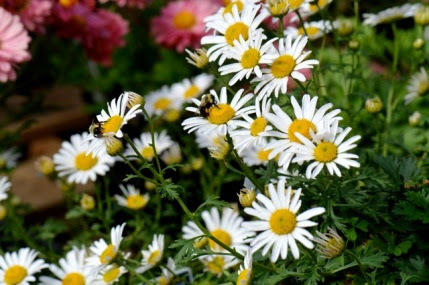 I have tons of late blooming mums, Montauk daisies, asters galore, native white Sanguisorba canadensis (a bee magnet), sedums, goldenrod, and zinnias to name a few highlights. 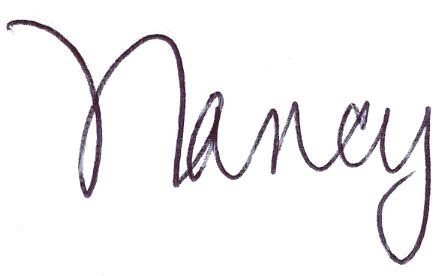 What’s STILL to come? Beautiful blue Rabdosia longituba is beginning to open, and Aster ‘Raydon’s Favorite’ is in tight bud. Some of the very latest perennial mums aren’t even cracking color yet. Allium thunbergii ‘Ozowa’, a diminutive ornamental onion, is starting to turn purple. On my days off, when the sun is low in the sky, I sit with a glass of red wine and relax to the sound of the life in my garden. I am taking advantage of every ray of sunshine right now. Make sure to stop by this week. Grab some spring blooming bulbs (they are selling really fast this year), stock up on colorful kale, winter pansies, dramatic grasses, and pumpkins for your patio pots. Fill a wagon with late blooming perennials and make the bees in YOUR yard happy too!